Chinook salmon may still be in trouble in B.C., Alaska and Washington, but Fraser River sockeye appear to be coming back gangbusters this year – as expected – and even steelhead in northern B.C. rivers like the Skeena appear to be coming back in greater numbers. Returns of Fraser River sockeye were strong enough to warrant a 24-hour commercial opening on August 8, following an opening for First Nations. It’s the first time there has been a commercial opening for Fraser River sockeye in four years. Based on low sockeye returns in some river systems in Alaska earlier this year, there were concerns that 2018’s sockeye return in B.C. might not be as strong as it should be, especially on the Nass and Skeena rivers. But Skeena sockeye at least appear to be exceeding expectations. >Fisheries and Oceans Canada (DFO) confirms that Skeena sockeye last week were already exceeding the high pre-season forecast of 1.4 million. It also confirmed that steelhead returns for both the Skeena and Nass rivers are well above average. As for pink salmon, even-year runs are traditionally weaker than odd-year, so big pink runs aren’t expected this year. So far, pink salmon returns for the north coast are “quite poor,” according to DFO. For the sport fishing sector, Fraser River sockeye abundance is something of a consolation prize, because it has seen severe restrictions placed on chinook this year. A recreational opening for sockeye started August 7 and runs until September 3. The big question for the commercial sector is whether there will be any significant openings in September, when the Adams River sockeye return. Adams River sockeye are the most abundant, but even if they return in large numbers, that doesn’t necessarily mean an abundant commercial harvest, because if they return at the same time as coho and steelhead, there could be conservation closures to protect those weaker stocks. Fraser River sockeye have traditionally been the bread and butter of the B.C. commercial fishing sector. But over the last couple of decades, a combination of extremely low returns in some years and stricter conservation measures to protect weaker stocks even in more robust years has shut the commercial sector out of the once lucrative Fraser River sockeye fishery for years at a time. British Columbians may be surprised to learn just how few salmon the commercial sector in B.C. takes, compared with other Pacific nations. In 2017, Canadian fishermen harvested just 1% of Pacific salmon, according to the North Pacific Anadromous Fish Commission. American fishermen, mostly in Alaska, harvested 53% of all Pacific salmon in 2017. Russia had the second-largest harvest level (38%). The median forecast this year is for 14 million sockeye to return to the Fraser River, with a high forecast of 22 million. In 2010, just one year after an extremely poor return of just 1.6 million fish, 28 million Fraser River sockeye returned, followed by 19 million in 2014. 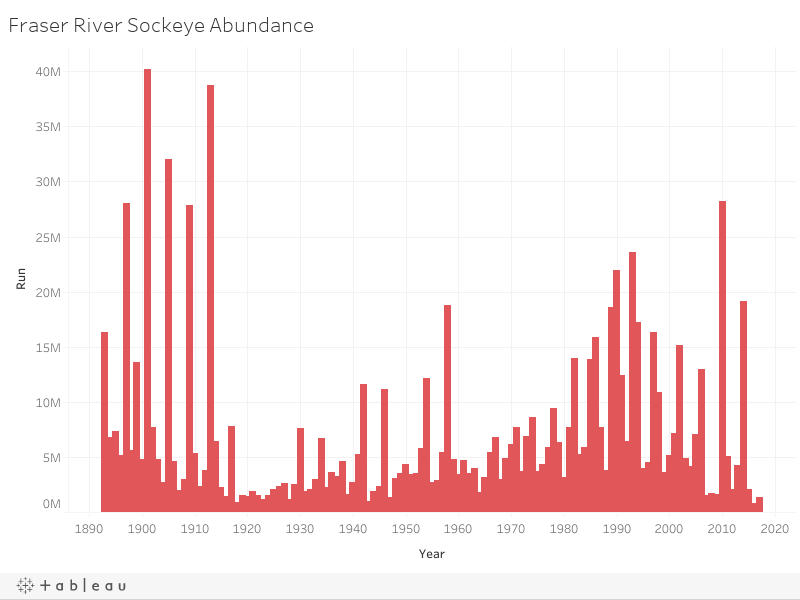 Despite concerns about falling salmon stocks, historical data show Fraser River sockeye were actually more abundant throughout the 2000s than they were throughout the 1960s. They were subject to extreme highs and lows, but overall, the average abundance has been higher. Over three four-year cycles (12 years), between 2006 and 2017, 80.8 million Fraser River sockeye returned, compared to 54.4 million between 1960 and 1971. Click link to see graph on historical Fraser River sockeye returns. See related story, Report lauds aquaculture upsides in protein production.